4x14 Wicker Brushed Nickel Floor Register Discounts Apply ! Nickel floor registers are an affordable way to give your home a facelift. 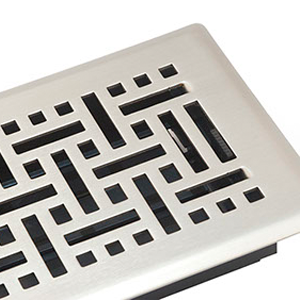 These decorative air vents have a plated brushed nickel finish over a steel core. Your nickel floor register features an adjustable plastic damper for comfort control. This is more than just a decorative air vent, it's also rated to hold at least 200 lbs. Nickel floor registers will work great with decorative accessories that you have in your house. ***Hint: The industry standard is to order decorative air vents using the actual hole opening size and not the faceplate size. These nickel floor registers will fit a 4 x 14 inch hole opening. 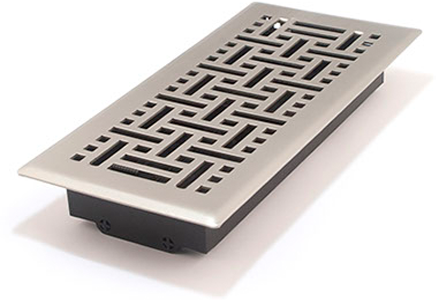 Decorative Air Vent Actual Faceplate Dimensions: 5 3/8 inches x 15 3/8 inches. These great nickel floor registers can be bought in a variety of sizes and multiple finishes. Ordering these decorative air vents is a great way to update your home. Get yours today!